A little bit rock ‘n roll, and a whole lot more—John Varvatos built his luxury brand around a love of music, a fascination of rock star style, and as a tribute to the edgy apparel worn by his favorite musicians. Ads for the company—at times, akin to hanging out backstage at a Stones concert—show off vintage-rock-inspired styles with a modern edge. The brand focuses on masculine clothing and accessories, including prescription eyeglasses and sunglasses. We’ve looked at the history of the John Varvatos brand to see what it’s all about. Though he had no formal training in design, John Varvatos was drawn to the world of fashion. He left college at 27 years old to take a job in sales at Ralph Lauren. There, he soaked up all of the knowledge he could, from clothing design to branding and everything in between. Varvatos later took his talents to Calvin Klein, where he was the head of menswear design and led the launch of the cK brand. In addition to involvement with successful collection launches, he was part of the team who debuted boxer briefs—considered a wardrobe revolution amongst those involved in the design world, and outside of it. Eventually, he made his way back to Ralph Lauren where he helped the Polo Jeans Company take shape. The John Varvatos brand launched in 2000 with a boutique in SoHo. The original John Varvatos line included tailored clothing and sportswear. From the beginning, the brand’s focus has been on menswear, and though a women’s line made a brief appearance, it did not continue. The brand has won multiple Designer of the Year awards. He unbound the rock and roll spirit completely when he turned an icon in rock history, the underground music club CBGB in New York City, into a clothing-boutique-slash-concert-venue. The clothing boutique celebrates the former club’s place in music history with tour posters, graffiti, and a moody color scheme—and the location still churns out riffs with regular concerts featuring old favorites and new musical acts. A single footwear collection designed in collaboration with Converse turned into an ongoing partnership, breathing life back into the Converse brand and adding to John Varvatos’ skyrocketing success. Over the past 18 years, the John Varvatos brand has expanded to include fragrances, bags, belts, and eyewear. Subtle, luxury detailing meets the rock lifestyle in the John Varvatos eyewear collection. John Varvatos V 602 sunglasses meld the vintage feel of clubmaster sunglasses with luxury details. 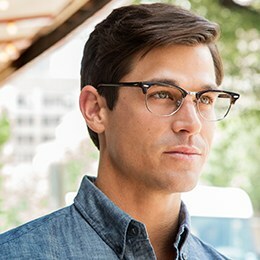 Modern appeal in a throwback style, John Varvatos V 201 eyeglasses show off little extras like you’d find in your favorite vintage shop—check out the keyhole bridge detail and intricate temple design. Let rock and roll style reign in these V369 eyeglasses—the music-centric John Varvatos ‘VR’ guitar logo features tuning pegs.